Combi boiler with tank on surface may seem like a boiler with a separate hot water tank, like regular or system boilers. But it’s not. These have a hot water storage tank built right into the boiler unit itself. You’d be forgiven if you thought it was strange to have a combi boiler with tank. Isn’t the whole point of buying a combi boiler that you don’t need a hot water tank for storage? For larger properties with multiple bathrooms however, a combi boiler with tank is perfect – especially with a larger family. You’ll need efficient heating combined with large volumes of hot water, and this is a great idea to simplify installation and save space. Why do I need a Combi Boiler with Tank? If you’ve had to go through a boiler replacement recently, or if you’re simply planning ahead, it’s okay to be a little bit confused. We’re here to help you through it. 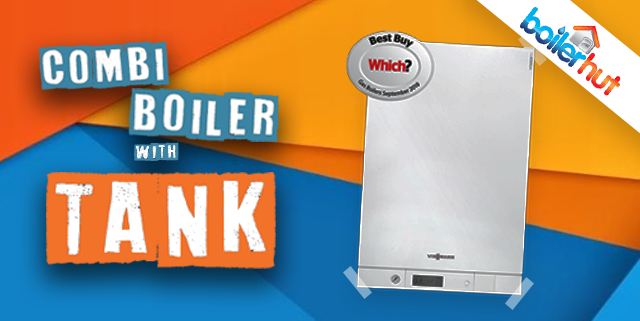 Let’s start with the obvious; why choose a combi boiler with tank? No hot water cylinder required; saving you a lot of space. Far more energy efficient, saving you more money in the long run. Much cheaper than Sealed System or Open Vent boilers. Installation process is quick and easy. My growing family needs the hot water more and more! Firstly, this is a very common problem, so don’t worry. You might find that your children have suddenly become teenagers who now make demands to use the shower all the time. Not the first time this has happened! For a property with more than one bathroom, a combi boiler with tank can be perfect. It delivers the hot water as and when you need simultaneously through multiple outlets! How can my family benefit from a combi boiler with tank? 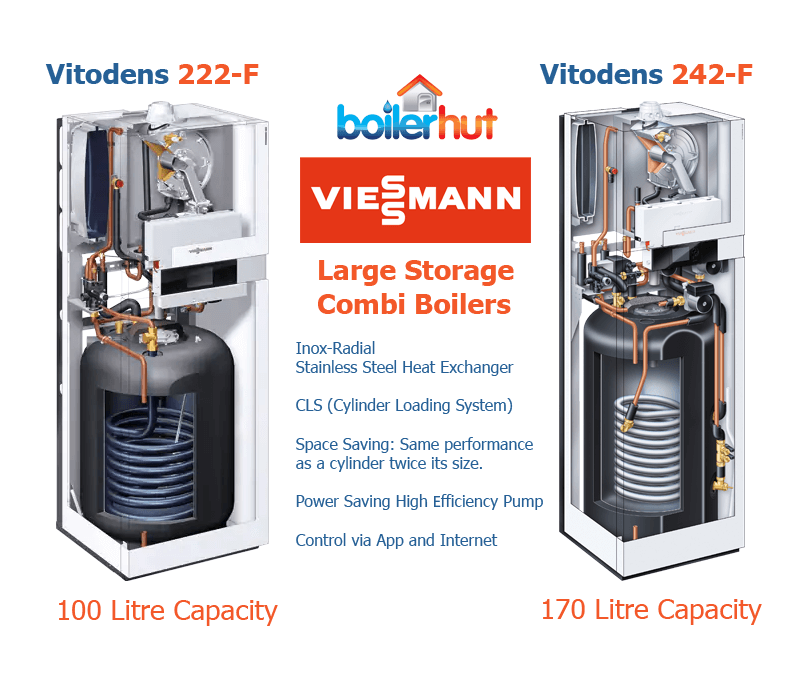 Combi boilers with a tank (also called storage combi boilers) such as the Viessmann 111-W, the tank is housed within the unit itself. This means you can still get those space saving benefits. Storage combi boilers have typically been floor standing units, but wall-mounted units are becoming increasingly common. The important benefit of storage combi boilers is that even with a tank built into the unit, you now have a much wider choice of where to place the boiler itself. For all of us with a growing family, shouldn’t we learn to benefit from extra space whenever we can get it? What type of property is best for a combi boiler with tank? A combi boiler with tank is best suited for larger properties that don’t have the space for water storage elsewhere. Families often choose these, allowing several outlets to be used simultaneously when people are typically getting ready for the day. On top of this, it still comes with the money-saving benefits of a standard combi boiler, only providing the hot water when it’s needed. Using the example of the Viessmann Vitodens 111-W, scroll down to find a cross-section image showing 46 litre thermal store inside. What is CLS (Cylinder Loading System) Technology? It gets mentioned a lot when talking about boilers, but what does it actually mean? Most unvented cylinders use a heating coil to heat up the cylinder. CLS technology specifically replaces this coil with a plate heat exchanger. A DHW (Domestic Hot Water) pump circulates the cold water from the bottom of the cylinder, through the plate heat exchanger and puts the hot water back to the top of the cylinder. 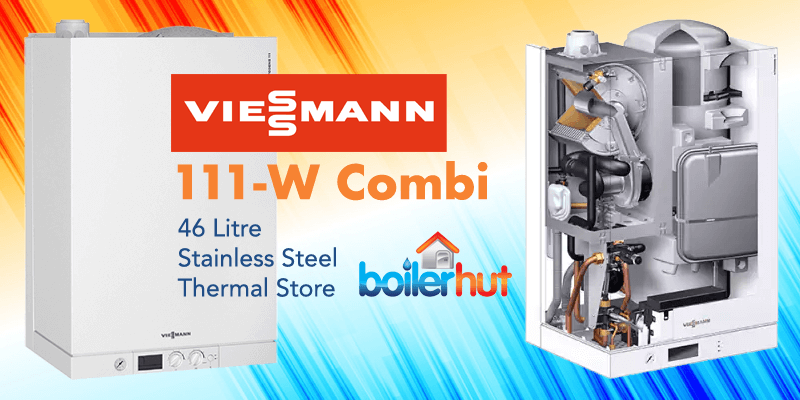 As a high performance wall-mounted combi boiler with tank, the Viessmann Vitodens 111-W is rapid, reliable and compact. It’s perfect for family homes with a high demand for hot water. Taking advantage of its CLS technology (Cylinder Loading System) and 46 litre integrated stainless steel storage tank, the 111-W has the capacity to fill a standard bath in just 8 minutes, whilst also supplying a sink or washbasin simultaneously. Once installed, you can also take advantage of a wireless programmable thermostat like EPH, or smart, internet enabled learning thermostats like Nest or Tado Smart Thermostat. All of these offer easy-to-use control for your heating needs. The Viessmann Vitodens 111-W ensures a comfortable & healthy climate, while considerably reducing your energy consumption. It has also been reviewed as a Which? Best Buy. 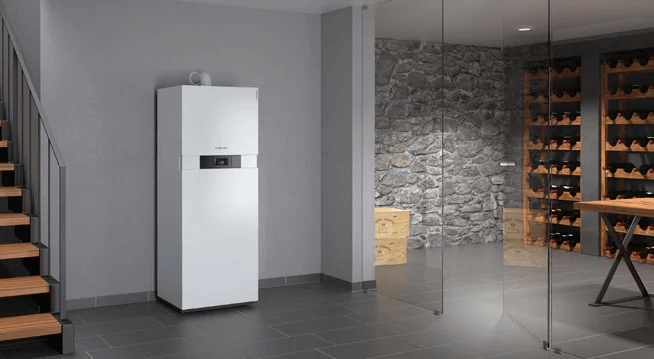 This combi boiler with tank from Vaillant delivers great performance at lower energy consumption. It produces 20 litres per minute of hot water when needed, and then modulates to using only 16% power, saving you fuel and money. ErP A rated for both hot water and heating efficiency. Integrated hot water storage device at the back of the boiler. Hot water within 5 seconds. A wide range of heating control options. The Vaillant is a much thicker boiler compared to the wider Viessmann. Because of the range of choice customers now have to suit their individual homes, it’s important to take proper measurements and consult a heating expert, so that you’re buying a boiler that’s suitable for your property. So, always do the research. 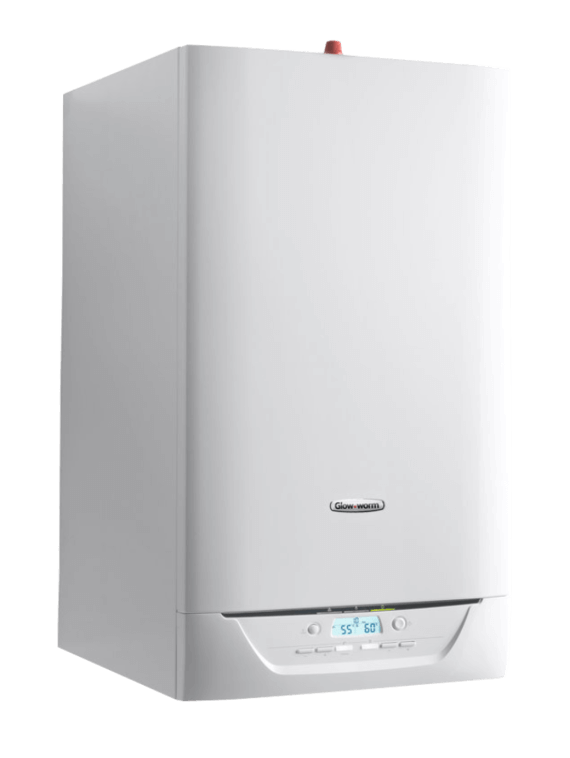 The Energy 35 Store is a fully integrated wall-mounted combi boiler with tank, providing efficient heating ideal for larger properties. The two 21 litre insulated tanks housed inside the unit provide a short re-heat time of less than 5 minutes. As a brand owned by Vaillant, The Energy 35 Store offers another solution in the world of combi boilers that includes a storage tank. Two highly-insulated 21 litre integrated tanks providing high performance heating and instant hot water supply to larger properties. Fast re-generation times of less than 5 minutes for hot water demands and quicker than hot water cylinders. Rapid DHW flow rate of 19.7 litres/minute to fill a bath quickly. Avoids the need for a hot water cylinder to free up space and reduces complexity and cost of installation. Lower running costs as the unit’s modulating Grundfos pump adapts to actual heating and hot water demand. 7 year guarantee with the option to extend. Integral enamelled loading cylinder or DHW cylinder with internal indirect coil, with a rated heating output 1.8 to 35 kW. A visually attractive combi boiler with tank that corresponds precisely to standard kitchen unit dimensions for easy integration. Colour touch-screen with plain text and graphic display, commissioning assistant and displays for energy consumption. 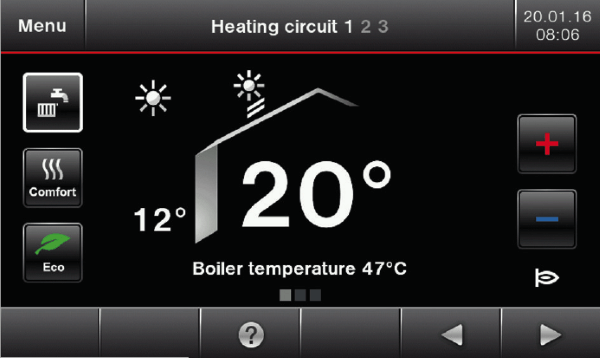 Web enabled capability for operation and service via Viessmann apps. Cylinder size 100 litres with thermal insulation. Dynamic burner cycling reduces the number of burner starts over the year by a third. No LPG conversion kit needed. Includes unvented safety kit and DHW expansion vessel. Automatic flue gas route adaption. The Viessmann Vitodens 242-F is a floorstanding gas condensing Combi Boiler with tank boasting state of the art, futureproof heating. Designed specifically with solar in mind, it’s prepared for direct connection of Vitosol solar collectors for water heating or central heating backup. Ideal for when premium space is available. Integral solar cylinder with solar coverage of 50%, meaning water can be heated with a saving of half the fossil fuel required. When choosing a new combi boiler with tank, it’s important to consider the size of the property in relation to how much water will need to be heated throughout. Don’t be afraid to take advantage of the space, if you have it. We can always recommend top-of-the-range units such as those listed above because you’ll be taking advantage of the most technologically advanced, highest efficiency premium boilers in the UK market. Space saving is one of the most important benefits of a Combi Boiler with tank, which is why CLS (Cylinder Loading System) has become such a standard in the industry. 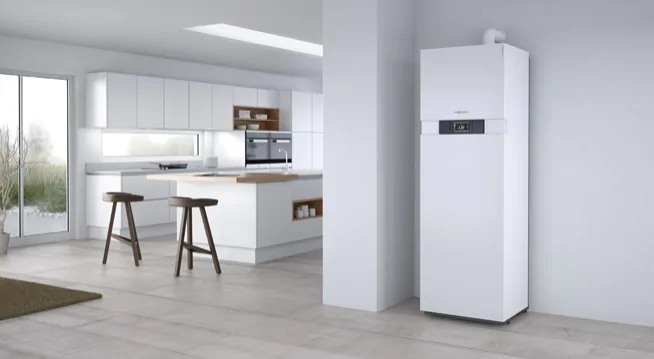 A combi boiler with tank like the 222-F or 242-F offers the domestic hot water convenience of an unvented cylinder with twice the capacity (200 to 300 litres). The Vitotronic 200 is a user friendly control unit with a bright 5 inch colour touchscreen that is intuitive, easy to understand and has a logical menu interface. The wizard simplifies commissioning of the boilers after installation. It saves time for the installers setting up a combi boiler with a tank. 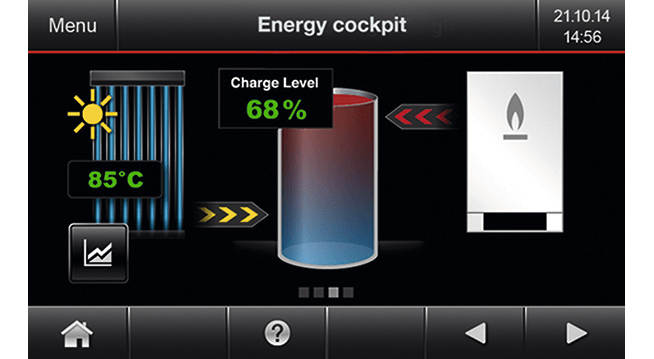 The energy cockpit indicates gas and electricity consumption of the heat source directly on the display of the combi boiler with tank. It also provides information on solar yield for an energy statement, on the cylinder loading status and temperature curve as well as temperature stratification in the cylinder for the combi boiler with tank. This patented heat exchanger is at the heart of every Viessmann boiler. It is one of the most durable and efficient and highest quality internal components found inside any domestic boiler in the UK market. And because Viessmann manufacture it in-house, they are able to compete on price. 98% Energy Efficiency and Above! 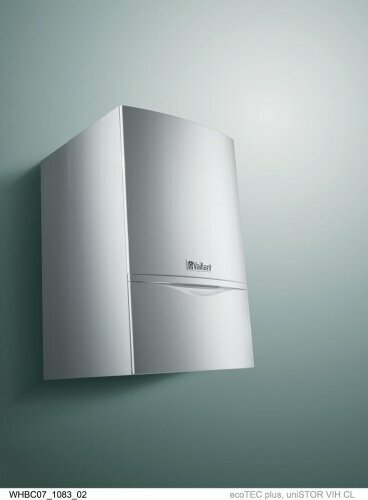 The Vitodens 200 range, which includes the 200-W, 222-F and 242-F, operate at an incredible 98% efficiency, which is the highest by far in the UK market for any combi boiler with tank. All the boiler offerings from rival manufacturers are between 89% and 92% efficiency. The Viessmann 200-W may even be above 100% efficiency in some cases with the help of weather compensation and smart controls, where it’s recycling outside air and is always condensing. 98% efficiency means gigantic savings on energy bills, because you’re wasting only 2% of the fuel going into your storage combi boiler. 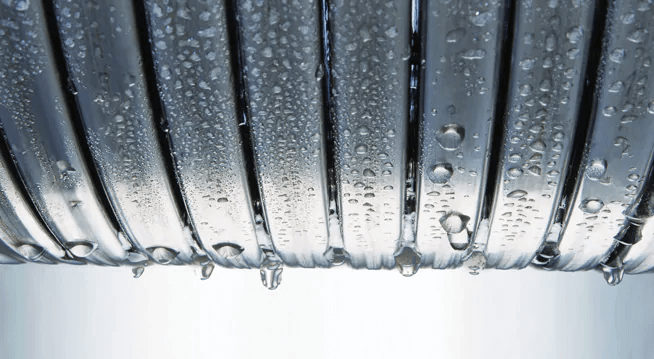 It sounds even more impressive considering your older non-condensing boiler (older than 12 years) may be between 50% to 70% efficient depending on wear and tear and corrosion on internal components. High energy efficiency not only helps you save money on your energy bills (between £300 to £600 per annum) and gives more consistent heating and water, but also leaves a cleaner, greener planet behind for future generations by reducing your carbon footprint. Read our reviews by clicking the link above and see exactly why our customers love us. To get the same high quality installation, free advice on heating, and excellent after-sales customer service, start by getting an online boiler quote. Simply enter your postcode below and hit the green button.